Starting in Frenchglen, this route loops through remote southeastern Oregon linking up the Sheldon and Hart National Antelope Refuges. We consider this route the biggest prize in Oregon bikepacking. The combination of commitment, the small window during the year when the route can be safely ridden, and the rewards that await you at each new hot spring if you pull it off are unparalleled. In addition to soaking in the Bog, Virgin Valley, and Hart Mountain Hot Springs, highlights include camping on the playa of a dried up ancient lake bed, poking around historic ranches, climbing Hart Mountain, and exploring the dramatic Thousand Creek Gorge. This is the most remote route we’ve ever ridden and is recommended only to the most experienced bikepackers. With no services on the route, you’ll need to carry food for your entire trip (possibly for up to 5 or 6 days) and at times up to 2 or more gallons of water. There is also no cell service on any of the route and any unrepairable mechanical or injury could have serious consequences. The riding itself is not particularly difficult, but I thought the route was more logistically challenging and significantly more committing than the Oregon Outback route. The best time to ride is in late spring after things start to dry out but before the heat of summer rolls in. As noted in more detail below, mud will make this route unrideable, so timing will be critical. Avoid winter, when snow and higher rainfall will shut it down, and the extreme temperatures of summer. Water access is also presumably less reliable in the late summer and fall, although we don’t know that for sure. Come prepared. We rode the route clockwise and collectively decided we’d do it that way again. I think the most compelling reason to do it this way is that the two Hart Mountain Hot Springs are the best of the bunch and we preferred hitting them last. The approach to Hart Mountain from the southeast is also much more dramatic and photogenic. The folks at the Frenchglen Hotel have always been very accommodating when we’ve asked to leave a car parked out front for a couple days. Other than the tiny town of Frenchglen where the route begins and ends, there are absolutely no services. Expect to carry all of your food which complicates planning and packing for a 4+ day trip. We encourage you to carry an extra cushion of food in the case of emergency or you end up moving slower than expected. Frenchglen is limited to a tiny general store and the Frenchglen Hotel, which serves lunch (open to the public) and dinner (by reservation only). We recommend eating at the hotel if you get the opportunity; it’s a great little place run by some really nice folks and the food is excellent. And they sell beer. Water will be one of your constant concerns on the route. Expect to carry excessive amounts of it through several sections, especially if you plan to do any dry camping. Despite the multitude of springs on the map, we found very little water along most sections of the route, including the entire Funnel Canyon area (miles 38-78). We were surprised given that it was early spring and they’d had snowfall in the area a week before we rode. Funnel Canyon is littered with wells and cow troughs, but we came up dry at all but one random well. I would absolutely not count on finding water in this section. We noted all reliable water sources on the map. Plan to carry everything you need in between those areas, despite the potential for additional sources. Knowing everything we know now, it would have made our trip easier – we were extremely conservative. Expect any lakes or reservoirs on your map that we did not mark with water symbols to be empty. Few of these exist any more. We highly recommend carrying a pump-style water filter instead of purification tabs or a Steripen. You’ll be drinking out of springs, creeks, and reservoirs, but many of them have resident cattle. It’s also possible you’ll find additional water sources that are too muddy or disgusting to treat. It’s worth the extra weight for the added security. Mile 41.1 – Slickey Lake: Camp in the playa of the now dried up Slickey Lake. We highly recommend this, with the full moon this was one of the most unique places any of us had ever spent the night. Note: dry camping. Mile 86.3 – Bog Hot Springs: Although we’ve heard rumors of red mite outbreaks at the hot springs, we wouldn’t let this deter you. There’s even a cold spring nearby for water access. Mile 106.3 – Virgin Valley Hot Springs: Technically these are “warm” springs, but it’s actually pretty refreshing after a hot day riding. Hot spring showers, water, pit toilets. The established campground is not great, but it beats the alternatives. Mile 134 – Catnip Reservoir: Rumor has it, the name has something to do with the resident mountain lions… Water is available from the reservoir. Mile 161.8 – Shirk Ranch: This would be dry camping, but it’d be a creepy, interesting place to spend a ghost-filled night. I’m sure at least one person was brutally murdered here. Mile 170 – Jacobs Reservoir & Guano Creek: These are first potential water options heading up towards Hart Mountain. While there are no established campsites, they’d be fine in a pinch. Given our experience, its position relative to the mountain, and the way the weather generally approaches this area, I would expect it to be windy. Mile 182.7 – Post Meadows: This is the first established campground as you approach Hart Mountain and the big climb. There are many more places to camp in this general area especially as you climb along the creek towards the pass. Mile 189.3 – Hot Springs Campground: This is the mother load campground with nice sites, pit toilets, creek water, and two hot springs to choose from. The hot springs are located down past the first group of campsites as you come in from above. As usual, we recommend using a GPS and the Benchmark Oregon Road & Recreation Atlas. Because this route crosses over into Nevada, we also recommend using the Benchmark Nevada Road & Recreation Atlas. I found the most helpful navigational maps to be the 7.5 x 7.5 “US Topo” maps you can download for free off usgs.gov. If you download all of the segments of the route and keep track as you go using navigational cues like the topography and landmarks, you can navigate the entire route with these maps. We also recommend visiting the Hart Mountain and Sheldon National Wildlife Refuge websites for more information and to download their brochures. Both brochures include rudimentary maps of the refuges which we found handy. This route comes close to qualifying as ECR Country, but not quite. I know some folks ignore our bike and tire selections and go skinnier, but I strongly caution against trying to ride this route on anything smaller than 2” tires. 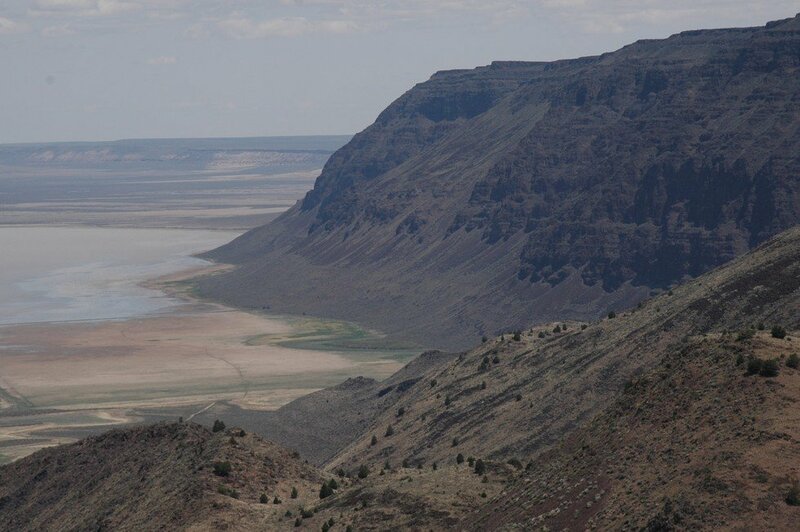 Steens Mountain Loop – The loop road is only open for a few short months every year (typically August and September) and generally these will be the worst months to ride this route. If you could time it just right and do the full route and the loop road, it would make for one hell of a bikepacking trip. This option adds 60 miles, 6,700 feet of climbing, and at least a day to your trip. You can skip the Bog Hot Springs entirely, saving yourself a handful of miles and some climbing. You can skip the steep gravel climb (you’ll be walking some of it…) up past Thousand Creek Gorge, taking the pavement up and around. You can take out a few miles and a lot of gravel skipping the Catnip Reservoir section. The other upside of this alternative is the view from and descent down the Dougherty Slide. This area is ripe with history and natural beauty. From the native Paiute people who once inhabited this much more lush land, to the cattle kings Peter French and Dr. Hugh Glenn (Frenchglen…), to the Basque sheep herders who temporarily reigned supreme over the cattle, this area has a surprisingly rich history considering it’s now mostly a dry, uninhabited dust bowl. The geology of the area is also unique, including the massive fault blocks of Steens and Hart Mountains, the unique drainage off Steens Mountain that creates the giant shallow lakes of Malhuer and Harney, and the rain shadow that creates the Alvord Desert. There are also several rockhounding areas just off the route. For anyone who enjoys obscure books, check out the slightly racist historical fiction novel “Pete French Cattle King” by Elizabeth Lambert Wood and Eileen O’Keeffe McVicker’s memoir of growing up on the flanks of Steens Mountain, “Child of Steens Mountain”. Lastly, and most importantly, we highly recommending checking out Gabe’s fantastic writeup and photos from our trip over at Limbertlost. Unique to this route, much of it turns into an impassable mud pit after any significant rainfall, rendering all travel through the remote sections pretty much impossible. I would suggest waiting at good 4 to 5 days after any rainfall and make sure the forecast for your trip is rain free. This severely restricts the open windows when this route can be safely ridden. Another consideration is hunting season – we’ve been led to believe that this area is heavily hunted in the fall. While I wouldn’t necessary feel unsafe riding the route during hunting season, if there is heavy hunter traffic on the more remote sections it will change the character of the route, possibly spoiling the experience. One other random thing I wish I’d known beforehand is that NOAA does not have precipitation radar over this entire area. So if you start obsessing over the weather, as I did after getting shut down on this route several times, don’t rely on the radar to show if its raining. I suggest checking daily rainfall totals for surrounding cities. We rode the route over 4 days, which included driving from Portland and back again. We felt rushed the entire trip, did not have sufficient time to fully enjoy soaking in the hot springs, and no time to go exploring some of more unique places we found ourselves. We recommend turning this into a 5 to 6 day trip if at all possible and allocating some extra time for the hot springs, hiking into the mouth of Thousand Creek Gorge, and hiking up to the top of Hart Mountain.